What are the main uses of a living room? Focused it is a versatile sitting area for your house, where you spend time, have coffee, watch movie, attend your guest. This part of the house is frequently used, and the furniture is almost depreciated every year. 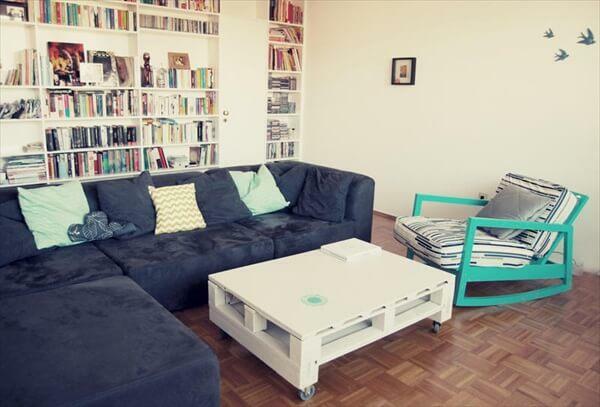 The most important part of the living room is the coffee table. 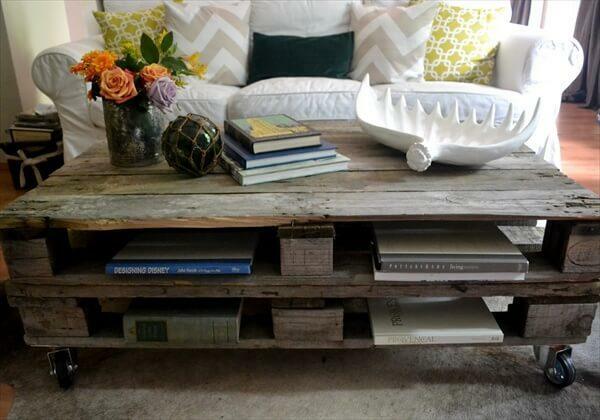 A beautiful coffee table can change the entire look of the room. But it can not necessarily be expensive. 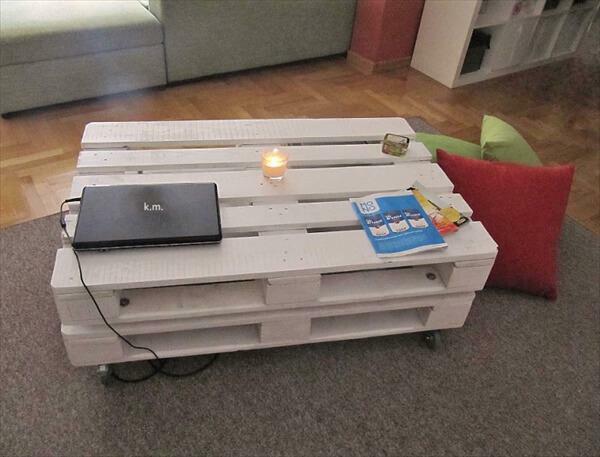 Now the pallet coffee table is made for you not only in your budget, but also beautiful and unique. 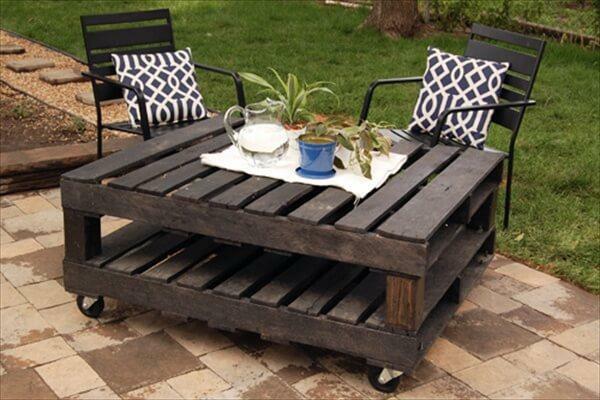 Pallet coffee table is of two types. Firstly it is with the pallet wood top i.e. the coffee table’s base and the top both are made up of the pallet wood. 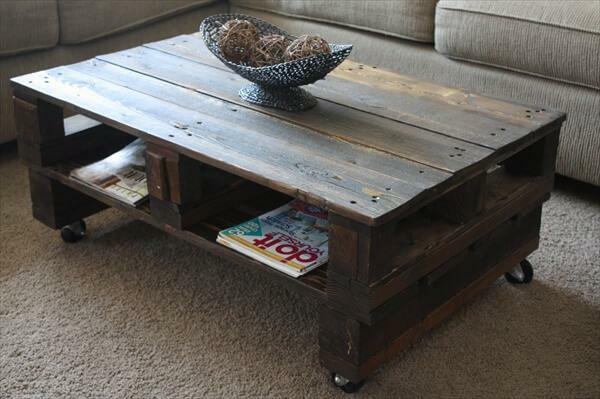 And the second one is the pallet coffee table with a glass on top. This is very beautiful, as it gives a complete modern look to your living room. 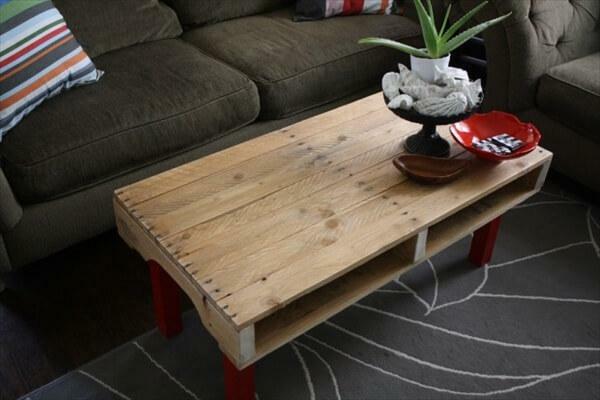 The base of the coffee table is made up of the pallet frame, and then that base is painted in the color which combines the whole interior of the room. The base can be decorated with flower vase. Pallets can be seen lying for nothing on landfill areas, the extreme climates brought the rusticity to them which can utilized in number of way to mimic the old age! This skid also looks pretty rustic and has been finished only with some wooden legs to be changed into vintage type of table! 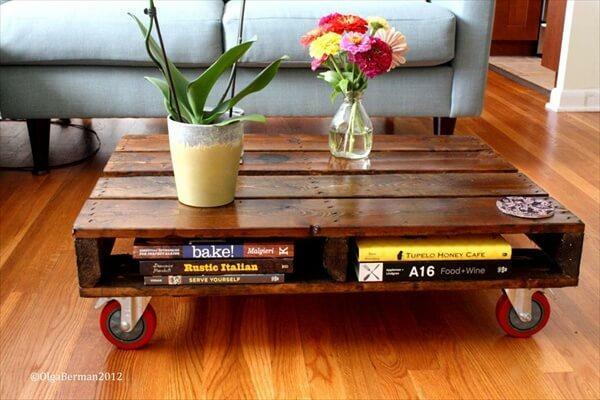 Raise the according sizes of pallet boards on wheels, on some sturdy wooden or metal-made legs to gain beautiful coffee tables for different locations of home where you want to sit in very of your free time! This one comes with a book rack and really looks stunning in sparkling dark brown wood tone! 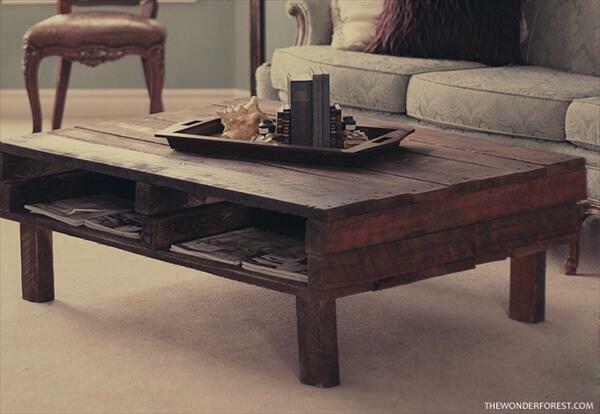 Mimic the mid century inspired furniture by going wisely with rustic nature of pallets, repurpose the rustic pallet boards and gain this prehistoric look of wooden coffee table without getting your wallet empty! 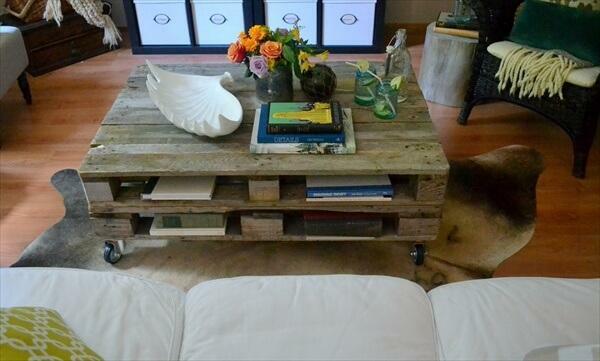 This pretty rustic manifestation of coffee table has been achieved by stacking 2 pallet boards having signs of wear and tear! Pack the pallets in bottom-to-bottom style and raise the total bunk shape on wheels for a skated or rolling movement! This structure can speak volumes for furniture-friendly shapes of pallet boards, one pallet on another, is all responsible here for this amazing pallet coffee table! It would be best to choose for guest entertainments and patio sitting affairs! This is what the rustic lovers look for to manifest the older and traditional look of their interior spaces! A complete, zero-cost and antique wooden design and can be utilized to give any space a mid century inspired touch! 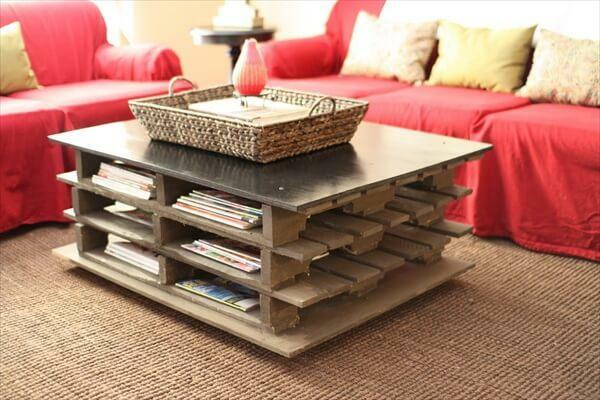 This structure has also been completed using timeworn pallets! This one comes with a modern expressions and is a whole creative amalgamation of pallet and plywood! Offers storage pockets on all sides and has been given a chic contemporary appearance using solid white paint coats! For a more sophisticated behavior, the caster wheels just play a magnificent role and also gives it a faster rolling movement! Stack two clone sizes of pallets with in-between wooden supports just to create a little bit spacing inside and let this bunk shape rock as a pallet furniture for any sitting environment! You can personalize the appearance and overall look of it for vintage, shabby chic, distressed and modern look! This pallet-bunk may be tough to drag due to its bulky mass that’s why it has also been given a skated movement using hardware wheels! You may be a follower of vintage and antique decors, so for according furniture set you can get amazing help from pallets! This storage-friendly coffee table design with ultra rustic appearance can really be a central addition to your mid century inspired sitting furniture sets! Pallet pockets have creatively been planned for respective storage of items mostly the books and newspaper! In these coffee table layout, the wooden slats have been packed ingeniously to create different levels while the vertical supports have been added among different levels to gain multiple storage options and pockets to hide and store the relevant stuff! 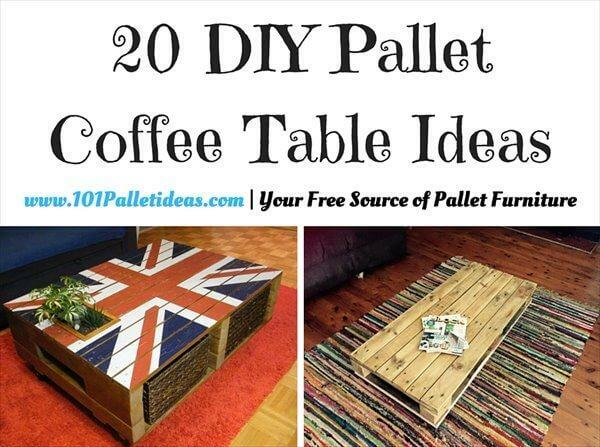 You can follow the given tables to explore 20 unique inspiration of more DIY pallet coffee table ideas that are also based on realistic and innovative concepts and approaches and will make you a big fan of flexible functioning of pallet wood and hence the pallet wood recycling!